ST. GEORGE — Small businesses and nonprofits affected by this year’s severe drought conditions are eligible for low-interest federal loans to help offset any economic loss caused by the drought, as long as they apply within the next month. Loans are being offered to businesses operating in a wide area of the U.S. southwest, including three Southern Utah counties. The deadline to apply for a loan is Nov. 8. Droughts are among the most costly weather related events and the most far reaching. 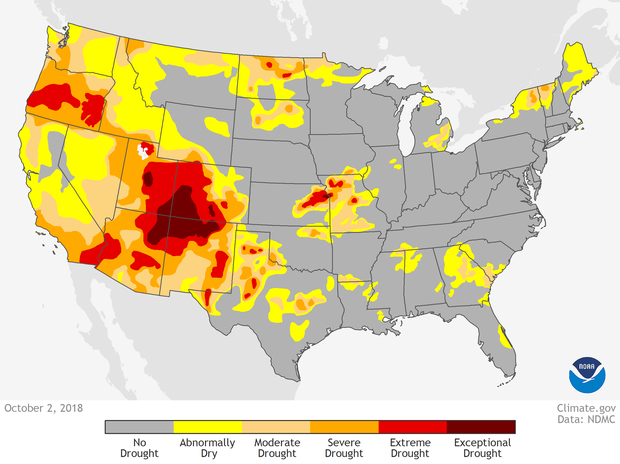 According to the National Oceanic and Atmospheric Administration, from 1980–2014, there were 22 drought events across the U.S. with losses exceeding $1 billion each. Drought conditions in Southern Utah have ranged from severely dry to exceptionally dry due in large part to last year’s abysmally low snowpack. Some areas in southeastern Utah have even declared drought emergencies as a result of this year’s dry conditions. In Utah, businesses in Washington, Kane and San Juan counties may apply for the loans. Regionally, businesses in Mohave and Coconino counties in Arizona and Clark and Lincoln counties in Nevada may apply. Small nonfarm businesses, small agricultural cooperatives, small businesses engaged in aquaculture and most private nonprofit organizations of any size may apply for economic injury disaster loans of up to $2 million. The interest rate is 3.385 percent for businesses and 2.5 percent for private nonprofit organizations with terms up to 30 years. Loan amounts and terms are based on each applicant’s financial condition. “Economic Injury Disaster Loans may be used to pay fixed debts, payroll, accounts payable and other bills that cannot be paid because of the disaster’s impact,” Tanya Garfield, director of the U.S. Small Business Administration’s Disaster Field Operations Center-West, said in a news release issued Thursday. Businesses primarily engaged in farming or ranching are not eligible for the Small Business Administration’s disaster assistance, though nurseries are eligible for assistance in drought disasters. Agricultural enterprises should instead contact the Farm Services Agency about assistance made available by the U.S. Department of Agriculture. Applications for the disaster relief loans may be completed online at the Small Business Administration’s disaster loan assistance website. Applicants may also call 800-659-2955 or email disastercustomerservice@sba.gov for more information on disaster assistance. Individuals who are deaf or hard‑of‑hearing may call 800-877-8339.